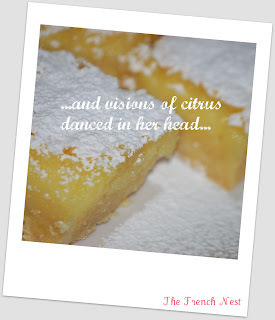 After having been 'start struck' a few weeks back meeting Anna Olson at her bakery in Port Dalhousie, and having tried one of the lemon squares there, I was inspired to bake my own. This recipe is adapted from Anna's own recipe, which is featured in her cookbook, Sugar. 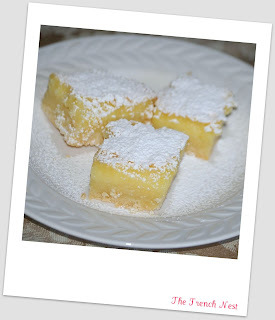 As the ultimate lemon lover in our house, I can attest (and so can my waist line) to the fact that these squares have been made on a weekly basis since meeting Anna...they are just THAT good! 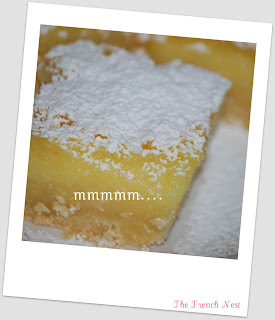 The finished product is meant to cool entirely and then refrigerated, but, in our house, the lemon squares barely make it out of the oven before they are devoured! So pucker those lips up and get ready to enjoy these squares as much as we do! *For the crust: In a medium bowl, cream the softened butter with an electric mixer on medium speed. Add the icing sugar and 1 cup of the flour, and beat on low speed until incorporated. Increase the speed to medium, and beat until well blended. Press the dough firmly over the bottom of the pan. Bake in the over for 15 minutes, until lightly golden. Set aside to cool. *For the topping: In a medium bowl, combine the eggs, granulated sugar, remaining 2 1/2 tsp of the flour, the lemon juice and the zest. Beat with the electric mixer on low speed until well blended. Spread over the cooled crust and return to the oven for 20-25 minutes more, until set. Let cool thoroughly in the pan before cutting into 2-inch squares. Dust with icing sugar. 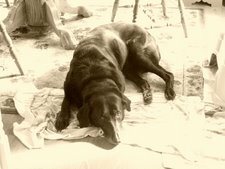 Having had no luck Saturday mornings at garage sales, mum and I had very little hope that this past Saturday would be any different than the Saturdays before it. Boy, were we wrong! Our first stop was at a street just around the corner from our house and it always seems to us that the closer the garage sale is to home, the better the finds always are! The couple told us that they were downsizing after having lived in their adorable bungalow for about 30 years, having raised their own children there who were now married and starting families of their own. There were boxes and boxes of old Nancy Drew books, board games from the '70s, and '60s Life magazines that I was itching to get my hands on. 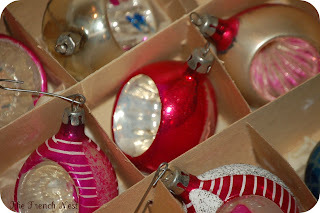 After having stocked up on most of the magazines and other goodies, I spotted, out of the corner of my eye, a box full of vintage blown glass Christmas ornaments...shades of pink, white and blue had been handpainted onto the glass, which was then adorned with German glass glitter and other pretty novelties. 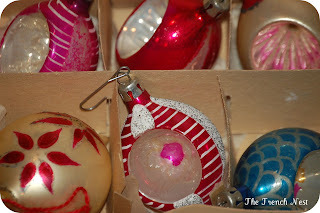 Some of the ornaments even had their original ornament hook attached to them. I knew right then and there that I just HAD to have them! 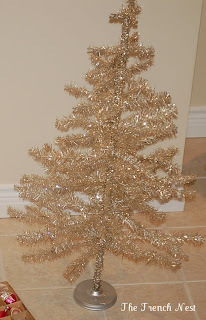 Later on in the day I spotted a silver Christmas tree (exactly what I had been looking for for years! 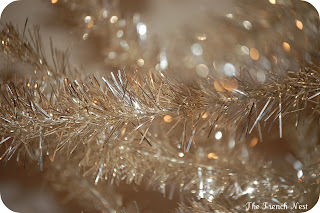 ), with silvery, glittery bristles...perfect for showcasing those gorgeous ornaments! 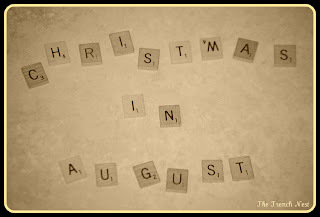 So, with Christmas just a few months away (119 days to be exact - but who's counting? ), it was the perfect little fix to get me into the Christmas mood...and give me hope that I will be just as lucky this Saturday morning as I was last! One of the highlights of summer vacation are the day trips you are afforded to take - no time limit, no pre-planning necessary - you can pack the car in an instant, pack a light picnic lunch and be out of the door in minutes flat. This summer, like plenty of summers before it, was filled with picnics at the beach, theatre in the park, car trips, sightseeing, antique hunting, and plenty of small-town adventures. The best day trips are also the ones that were not planned - they're the small towns you stumble upon as you make the transition from city life to country life, and they are often the very places that you'll find plenty of treasures and favourite shops. At the beginning of the month, we spent one morning debating on what to do and where to go until we finally decided to hop in the car and venture out of the city. We didn't know where we were headed, but hey, that's part of the fun, right? 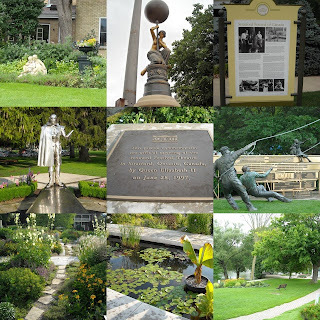 Well, that afternoon we happen to have ended up in Perth, Ontario, a small heritage town with lots to offer in the way of fabulous shops. 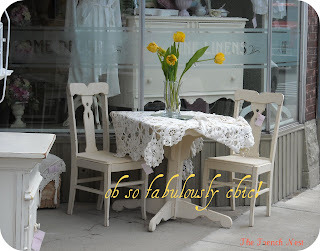 One such shop was a vintage-inspired furniture/jewellery/home decor store, so you can just imagine my and mum's delight when we found it! A French mold and antique white birdcage adorned the display case, while a beautiful refurbished vintage kitchen table sat outside. With white and pink accents galore, we knew we had to stop in and visit. 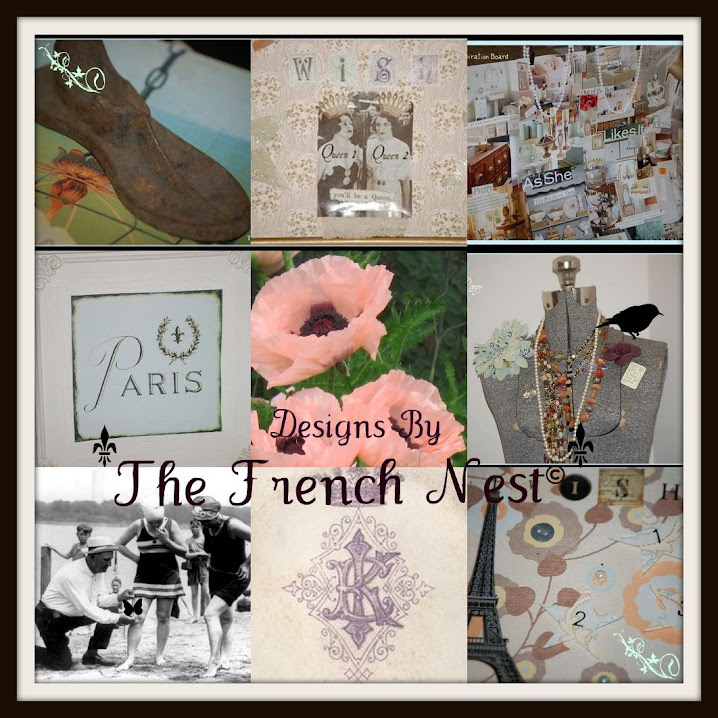 Antique pictures and books, costume jewellery, refurbished armoires, dressers and bed frames...ohh la la! This store met all of our needs, and gave me plenty of design ideas for my own apartment. So, no matter where you end up you are bound to have an adventure. 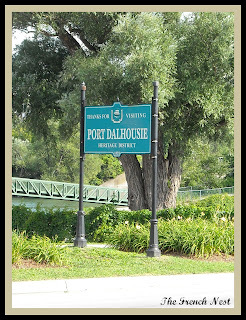 And, who knows, along the way you may find a favourite destination spot to visit in the years to come...I know I did! 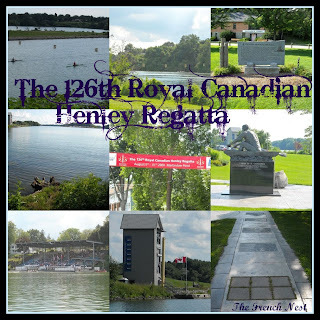 A few weeks ago, we visited Port Dalhousie, a heritage district located in St. Catherines (otherwise known as the "Garden City") to watch the 126th Royal Canadian Henley Regatta Championships. We had a great view from the stands, and enjoyed cheering all the teams on. We also enjoyed browsing through the "marketplace" which was located just a few blocks down the road, and came across Olson Foods and Bakery. As you all know, not only am I a HUGE Food Network fan, but, I am also a huge Anna Olson fan - I never miss a single episode of "Fresh" and still watch re-runs of "Sugar". So, you can just imagine my surprise when I stumbled into her bakery only to see her standing there! Talk about star struck! So, I hurriedly ran to the cash register and picked up a copy of one of her cookbooks to have signed, fixed my hair quickly and grabbed my camera out of my purse. She was so friendly, provided me with lots of baking advice, and then told us which farmer's market stands to visit on our way back home to the city. Of course, we had to check one very big thing off of our 'TO DO' list before we did anything else - sample the desserts at the bakery...we got a date square, pecan butter tart, lemon square, raspberry square and a s'mores bar...absolutely delish! And, hey, we couldn't leave without trying one of everything. On our way back home, we stopped off at the fruit and veg stands Anna had suggested and picked up some corn on the cob, green beans, potatoes, rhubarb, and berries for dinner/dessert. What a great day! The nest has relocated! 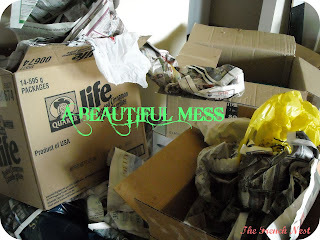 On the first of the month, I packed up as much as I possibly could and headed towards my new "nest" for the year - a one-bedroom apartment in a beautiful city which offers the best of both worlds: flashy club life by night and artsy village by day. I packed everything from my Queen size bed and mattress to my wire French dress mold (I couldn't forget her, now could I? ), and a whole lotta little bits in between! I wanted to give you all a sneak peak of my new pad, and will post more pictures once EVERYTHING looks all fancy-shmancy. It's missing a certain something right now - colour, maybe? Nothing a bouquet of fresh flowers won't cure! 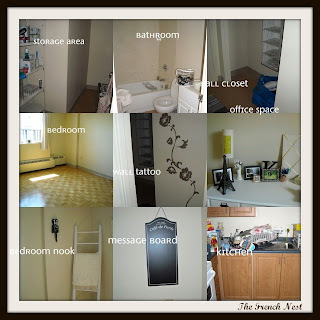 The apartment offers a ton of space, including 3 closets (although, and I'm sure you can all relate here, there is still not enough space or shelves for all my clothes, handbags and shoes). I'm really looking forward to cooking my first meal in my brand spankin' new apartment! Any special recipes out there you could share with me for my first night? 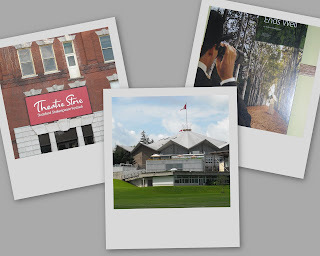 This past weekend, we packed our bags and a picnic lunch and ventured off to Stratford to watch Shakespeare's "All's Well That End's Well" at the Stratford Festival. 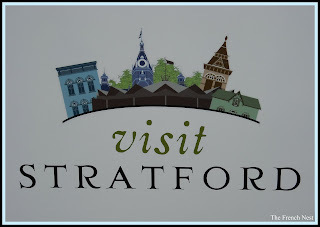 I had never been to Stratford before, but was pleasantly surprised as soon as we came across the quaint antique shops, worn and aged signs that paid homage to the town's heritage and traditions, and the vast amount of rich, green farm land - complete with horses, cows, and sheep....everything a city girl dreams about coming across one day! 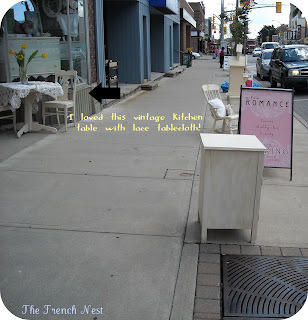 We spent our days walking up and down Ontario Street - Stratford's version of L.A.'s Rodeo Drive. This street stretched for what seemed like miles and we shopped through the small boutiques hunting for bargains and small-town treasures - including books, clothes, home decor, and my personal favourite...kitchen items at Bradshaw's. 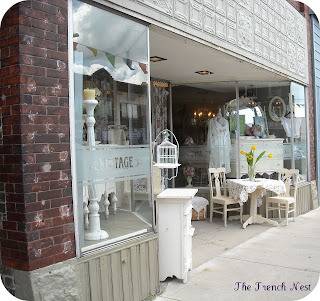 This was a store established in 1895 and it has grown to include everything from dishes and home decor items to linens and the most unique and modern kitchen appliances you could think of. I ended up buying a beautiful glass mannequin hand which will display all of my bracelets and rings. 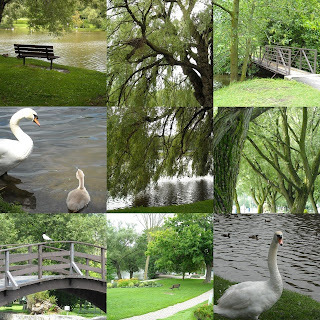 We spent each morning enjoying breakfast down by the lake, taking copious shots of the famous Stratford swans, the stunning lake, and the beautiful trees while enjoying the gorgeous weather. In the evening, we divided our time between swimming laps in the enormous pool, relaxing in the hot tub, playing pool on the hotel's antique billiard table, and dining in the downtown bistros. We spent our last evening enjoying the play "All's Well That Ends Well" at the Festival Theatre, starring Brian Dennehy. The play, by the way, aside from the occasional obscure Shakespearean jargon, was fantastic! Although there was no meet 'n' greet with Brian Dennehy after the show (sorry Susie! 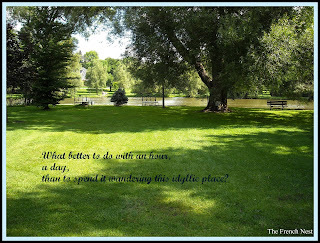 ), it was wonderful to get out of the city, away from the noise, pollution, and dare I say, shopping malls, and spend the weekend in beautiful Stratford, Ontario!